Rookie of the Year contender Daniel Hemric, No. 8 Bass Pro Shops/Caterpillar Camaro ZL1 recorded the fifth fastest time. Hemric’s Richard Childress Racing teammate and defending Daytona 500 winner, Austin Dillon, No. 3 Dow Camaro ZL1, placed 10th on the speed chart at the end of the qualifying session. Beyond positions one and two, the starting order for the rest of the Daytona 500 field will be determined by the outcome of the Gander RV Duel which will be held on Thursday, Feb. 15 at 7 pm ET and will be aired live on FS1, MRN, and Sirius XM NASCAR Radio Channel 90. POST QUALIFYING PRESS CONF. TRANSCRIPTS:WILLIAM BYRON, NO. 24 AXALTA CAMARO ZL1, POLE WINNER, and CHAD KNAUS, CREW CHIEF, NO. 24 AXALTA CAMARO ZL1 THE MODERATOR: We are now joined by the Busch pole winner for the 61st annual Daytona 500. That is William Byron, driver of the No. 24 AXALTA Chevrolet. This is William’s first Monster Energy Series pole award, and it is the 700th Cup pole for Chevy. We are also joined by crew chief Chad Knaus. We will open it up to questions. Q. Did you come in expecting ‑‑ obviously you thought you had fast cars, but was the expectation to come away with a pole, and how does it feel to walk away with a Daytona 500 pole? WILLIAM BYRON: Yeah, I think we were realistic. We probably thought we were going to be somewhere in the hunt. The guys have done a lot of work to get down here. It’s kind of been a, I guess, hard‑working off‑season for them, and there’s been a lot of things in the works, so I was excited to get down here and see what we had. But ultimately you never know who’s going to pop up and be competitive and fast down here. Great to get a pole. Big for Chevrolet, I guess, with their accomplishment there. We’re looking forward to kind of checking this off and going on to Sunday. CHAD KNAUS: Yeah, much like William said, you never know what you’re going to have until you get down here, with the limited amount of track time that you have. But based off of what we had last year, we felt like we were going to come down and be competitive. I’ll be honest, when the Penske guys went out there, I didn’t think we were going to be able to necessarily eclipse what they put up, and then fortunately we did. A lot of hard work and a lot of effort for and from everybody at HMS to be able to do that. The top four spots, that’s a pretty amazing feat I feel. If you go back and you look at our qualifying efforts at the superspeedways the last handful of races, all four of those cars have been in a pretty tight box, and that’s a pretty amazing thing to do. Q. Obviously, you have to have the cars to be able to do what the SHR guys did at Talladega in October, but you guys seemed to have really good cars, one, two, three, four here in qualifying. Is there a possibility you can get linked up, maybe try to replicate what they did there in October? CHAD KNAUS: I think we can give it a go. That’s kind of the plan, obviously. This is a different animal at Daytona than what it is at Talladega. Handling comes into play significantly more. The 150 I don’t think will be a true judge of that. I think we from the 24 standpoint are going to probably pull out and play that pretty conservative and not try to make anything like that happen. But in the 500 you never know, especially with a short run at the end. I don’t know what you think. The mental energy and physical energy ‑‑ physical is not that much, but the mental energy of the whole race is very long, so you really don’t know who’s going to be around once you get to 15 or 10 to go. And then once you get to that point, it’s kind of anything goes at that point. So, you just start pushing anybody and trying to get to the front. But we’ll try to link up, but it’s going to be hard to do. Q. Chad, obviously more than most poles of the season, this one is really, really big for the team and all the work that everybody did behind the scenes. How does this pole really kind of help the team when it comes to their attitude for not only this week but starting the season off knowing that they’re building fast cars? CHAD KNAUS: I think it’s huge. William can attest to this; we’ve had a lot of late nights, a lot of long hours. We loaded up on ‑‑ I guess it was Thursday, right? CHAD KNAUS: I don’t even know what day it is anymore. WILLIAM BYRON: I was going to bed and these guys were loading up the car. It’s ridiculous. CHAD KNAUS: We’ve been working really hard, and these guys ‑‑ the thing that I think a lot of people don’t understand is yes, we have a very fast race car. It’s very easy to slow down a fast race car if you don’t get the details met, and the thing we’ve worked on extremely hard during the off‑season with the new guys that we’ve got on the team is just the procedures, going through the procedural duties and making sure we don’t miss anything, and that’s a big thing to being able to go to the racetrack and execute. Pretty amazing really. Q. Kind of along those lines, I’m just wondering if you guys could talk about this is the most fabulous way you could start off working together, I would imagine you could have is winning the pole for the Daytona 500.WILLIAM BYRON: Yeah, it’s really cool. This guy has done a lot over the off‑season for me to get developed and ready to go. Like he was saying with the guys, just the little things are huge. I feel like there’s a lot of things that we’re going through for the first time, but for me it’s kind of being here for the second time feels really comfortable. I get to go through the garage the same way, don’t have to worry about the newness of the Cup Series, so I’m looking forward to that, and I know we’ve got a hungry group of guys to go after it with. CHAD KNAUS: Young man. Q. Young man. In the off‑season, how much mentoring, how much time did you spend, and how rewarding is it to be able to have that kind of young man driver to be able to do that with now? CHAD KNAUS: I mean, we’ve spent a good amount of time together. I’m looking forward to the season to get going so we can spend more time together for sure. I do enjoy working with young talent. It’s a lot of fun for me. So, I’m looking forward to growing this relationship and seeing how it goes and goes and grows. It’s been a lot of fun. I really enjoyed the off‑season. I know you guys think I’m a geek and all that, man, but I’ve really enjoyed working with this team and these guys and the enthusiasm. Nothing against where I was, you need to understand that; it’s just a new thing, and it’s great, man, it’s a lot of fun. I think he’s got a lot of potential. His dedication and drive and desire to go out there and be one of the best drivers in the sport is evident, and I think his ability is pretty obvious just with what he’s accomplished in the past. You put that work ethic and that ability together, and you’ve got a pretty impressive little thing there. Q. William, now you get to ride the fine line for Thursday. How hard do you think you need to race to make sure you know what you have for the 500, and do you maybe dare, like hey, I’ve got a fast car, let me go try to win this qualifying race?WILLIAM BYRON: No, I mean, it’s kind of a ‑‑ for me the Duel doesn’t matter at this point. This was the goal to get the top two spots, and if we were second, that was great, too, but the pole is good, and now our goal is ‑‑ really what we have in the Duel is nothing like what we’re going to have on Sunday, so it’s not even worth scaring yourself or doing whatever to figure it out. I learned that last year the hard way. I think that I just look forward to being a part of it and seeing what that brings, and then Friday and Saturday is really our hard‑working days. Really the conversations we’ll have are important, too. Q. Does it bother you at all to have the car, then you and Chad decide at some point time to shut her down and back down through the field and get out of this stuff? How hard is that to do? WILLIAM BYRON: I mean, it’s looking forward to the bigger goal. The bigger goal is we’re here for the 500, not for Thursday night. From an outside perspective, yeah, maybe if I was watching, yeah, but I don’t care. I don’t think it matters. CHAD KNAUS: Yeah, our engine shop is pretty amazing. I think you can see that just from the accomplishments they’ve had over the course of the last ‑‑ well, the course of its existence is pretty spectacular, and to have all of those cars on the first four qualifying positions is pretty remarkable. As far as feeling 21 again? Man, I’m a long way from that. A wise man told me once, he said, when I was young, I used to go to bed sore and wake up feeling fine. Now that I’m old, I go to bed feeling fine and I wake up sore, and there’s some reality to that. But it has put some wind in the sails for sure, you know. To be around a young group of guys again, seeing that enthusiasm, the big eyes, the open eyes is a lot of fun, and it’s going to be a great time. ALEX BOWMAN, NO. 88 NATIONWIDE CAMARO ZL1, outside pole sitter, Daytona 500 and RICK HENDRICK, TEAM OWNER, HENDRICK MOTORSPORTS:THE MODERATOR: We’re going to get started with our media availabilities here following Busch Pole Qualifying at Daytona International Speedway in advance of the 61st annual Daytona 500. We are joined by Alex Bowman, who posted the second fastest time in qualifying today and will start on the front row alongside his Hendrick Motorsports teammate. Alex drives the No. 88 Nationwide Chevrolet. We are also joined by Hendrick Motorsports owner Rick Hendrick. 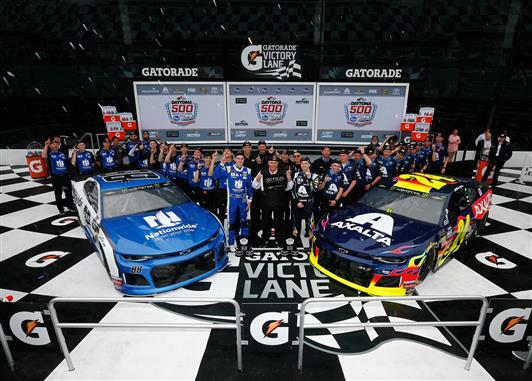 Hendrick Motorsports has won 13 Daytona 500 poles, including the last five in a row, both of which are records, and this will also be the youngest front row in Daytona 500 history. Q. Rick, you guys have seemingly had, at least based on qualifying, obviously, the fastest cars here for the past five years. Last one I believe you guys won was five with Dale, and Jimmie before that. Do you feel like y’all have had the best cars and circumstances have taken you out? How frustrating has it been to have the situation in Turn 4 just when you know you’ve got a really fast car? RICK HENDRICK: Well, it’s always tough when you run this race, and we led a lot of laps, and we just haven’t been able to close the deal. But that’s part of it down here. We kind of look at it like it’s multiple races. You know, you’ve got to qualify ‑‑ when I started, you just wanted to make the field, and nervous not to get in the race. We put a lot of emphasis on trying to sit on the pole and go for the front row. So, I think we’ve got the speed. We’ve got to get the handling now down, and I think this is our second year with this car, so I think we’re going to be in good shape. So, we’ll see. ALEX BOWMAN: You’re killing me. You’re killing me. Q. He was almost throwing the gauntlet down. I’m not trying to throw him under the bus, but I was wondering at some point if you’re going to actually set him up and set him down? He was pretty cocky about it. ALEX BOWMAN: Oh, wow, no, not at all. RICK HENDRICK: Yeah, he started it. For the record, he started it. I didn’t. But I’m going to finish it. It’s going to happen here in the next probably 90 days. ALEX BOWMAN: He told me in between rounds of qualifying that if I beat him, it would be bad for my career. RICK HENDRICK: No pressure. Q. On a serious note, no matter what happens in the race or no matter what happens the rest of the season, because we could talk about you’ve done well, but how valuable is this for your sponsors, for your partners, your stakeholders to have this moment in the sun, so to speak, because this weekend kind of belongs to you guys now with this front row? How valuable is it overall? RICK HENDRICK: It’s really valuable. I mean, you’re right, you’ve got a whole week to celebrate this. Our sponsors, we’ve got everybody coming. This is one of the largest crowds of sponsors we have that’s going to be here the next week. Allied is brand new. Their CEO was on the phone. My phones were blowing up. The Nationwide folks, their folks are coming. You know, AXALTA took a chance on a young guy. So, it’s really neat for the sponsors to say, hey, we like these young guys and we’re going to support them. It’s really good for Chad to come out of the box with he and William to sit on the front row. William is his age. So, it’s a big morale booster. No secret we didn’t have the year we wanted last year, so coming out of the gate, no matter what happens, we get to celebrate this for a week. I’ve been down here when I had a car in the back, one in the front, one in the middle qualifying, and then you have to answer to sponsors, well, why aren’t you giving them the same stuff. I’ve had that question for 35 years, or as many years as I’ve run two cars. So, this year to have them right on top of each other just means that the organization did a heck of a job, engine shop, body shop, teams working together. You’re right, man, this is the deal, to sit on the pole at Daytona. Q. Alex, usually second place is, meh, but in this case, it means something. Can you talk about that?ALEX BOWMAN: Yeah, absolutely. You know, it’s so cool to be part of HMS one, two, three, four. That’s really neat and just shows how well everybody is working together. You know, to be locked into that front row barring a disaster in the Duel is really neat and kind of lets us focus on getting our car driving really well and learning what we can through the Clash and the Duel and everything. It’s cool to be a part of. You always want one spot more, and it would be cool to have another Daytona 500 pole, but it’s cool to see William get that. I’m proud of the 24 team as well as the 88 team and just really focused on learning what I can in the next week and being the most prepared I can for the 500. Q. Alex, you got kind of the same kind of start a year ago and didn’t get the payoff. Will you do anything different? Is there something you’ve thought about as far as the approach to the 500 and the Duels that you can maybe use to make yourself stronger and more ready for Sunday and give yourself a better chance? ALEX BOWMAN: Yeah, absolutely. I hadn’t speedway raced in over a year last year going into the Duel and the 500, so that was a tough spot for me to try to kind of get caught back up to where things were at rather quickly. So, I think we ran really strong in the 500. We ran up front for a good amount of the day, and really, we had a really good shot at it, and I just kind of butchered the last restart and didn’t do a good job there and then got caught up in crash. You know, I’ve played that restart through my mind. I think we figured out where I messed up and I knew what I did wrong as soon as I did it, but we fixed that that week and moved on from it. You know, I’m definitely more confident going into this year. This car has got more handling built into it I feel like. I feel like it’s just going to drive better and I’ll be able to be more aggressive, and we’re still obviously really fast. I’m just ready to go, and like I said, I’m going to do my best to learn what I can throughout the week with the Clash and the Duel, but I’m really confident going into the 500. Q. Rick, do you have a message to the 24 and 88 teams on how to race on Thursday? And if you do, what is it? RICK HENDRICK: You know, I have had messages in restrictor plate racing all of my racing life and they never listen to me. I think, hey, draft together, and then they don’t. Try, but ‑‑ we want them to take care of the cars for sure. We want to be in the Sunday race, and we don’t want to put the cars in any unnecessary harm’s way, but we’re going to ‑‑ we’ve got to find out what we’ve got so we’re going to race. It’s kind of a two‑edged sword when you’re on the front row. You don’t want to take a chance on tearing up a really good car, but you’ve got to figure out what you have, too. So, we’re going to race. Q. Rick, it’s obvious you guys were burning the midnight oil in the off‑season, very much so. Where would you say you made the greatest gains because I know you didn’t want a repeat of last year and you’re to be congratulated for all you’ve accomplished thus far? RICK HENDRICK: Well, you know, this is one race with this car and then we go to a new setup altogether when we leave here. But I think ‑‑ and to sit on the pole, to be fast here, it takes everything. You’re stacking pennies in the engine shop. They work really hard. And you find a horsepower here and one there, and the bodies are in the wind tunnel, and it’s just a tremendous team effort to build a car and not make any mistakes.